I have been meaning to get better acquainted with the larger members of the plant world for some time. Being a ‘small’ gardener, my focus always seems to be on bulbs, perennials and compact shrubs which take up relatively little space. There’s nothing wrong in this, but one day I hope to expand my horizons and plant for the future, rather than just the next season or two. Walking home from work each day I pass two Liquidambar styraciflua (sweet gum), isolated in the pavement next to a busy road. I remember when they were planted there, maybe eight years ago. Then, they were young, weak and vulnerable. A third was vandalised within a year and never replaced. But the two that persevered in this unpromising spot are now tall, permanent and unassailable. I’m filled with awe as I witness them progressing towards majestic maturity. No perennial will ever give me that feeling. Anyone wishing to educate themselves about trees and shrubs, especially rarer ones, would learn a lot from a visit to BlueBell Arboretum & Nursery in Derbyshire. We dropped by in early March which, in retrospect, was probably when this developing woodland garden was at its least compelling. The focus was very much on showcasing the full catalogue, with special, unusual plants packed in cheek-by-jowl. I felt the overall composition and flow of the nine acre garden suffered slightly as a result. Acknowledging it was unfair to judge a garden at its lowest ebb, and before it had truly reached maturity (which takes a long time when you’re cultivating trees), I focused instead on the dazzling array of choice specimens. Bright, early spring days bring out the very best in birches. Fast growing, these are among the largest trees in the arboretum. 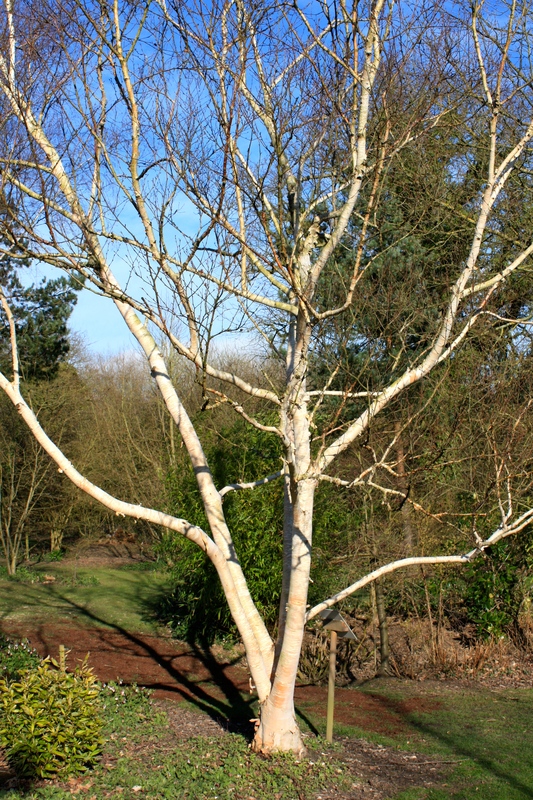 The first to catch my eye was Betula ermanii ‘Grayswood Hill’ (above), an aristocrat amongst birches. This impressive tree is a native of North Eastern Asia, including Russia, Manchuria, Sakhalin and Hokkaido. BlueBell Nursery recommend selections from Hokkaido for their greater tolerance of our maritime climate. 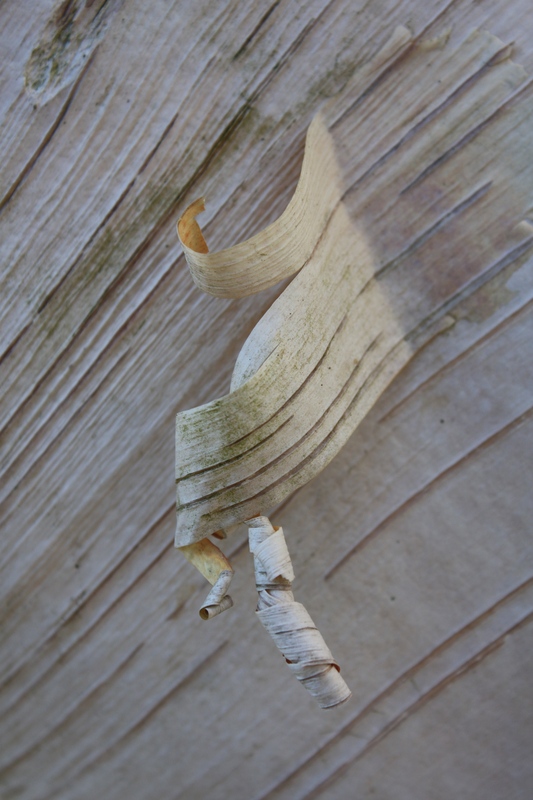 I adore the way the bark (below) is patterned with soft, blush-coloured lozenges (properly known as lenticels) which begin quite separate and then start to merge into one another. With longer, narrower striations is Betula utilis var. 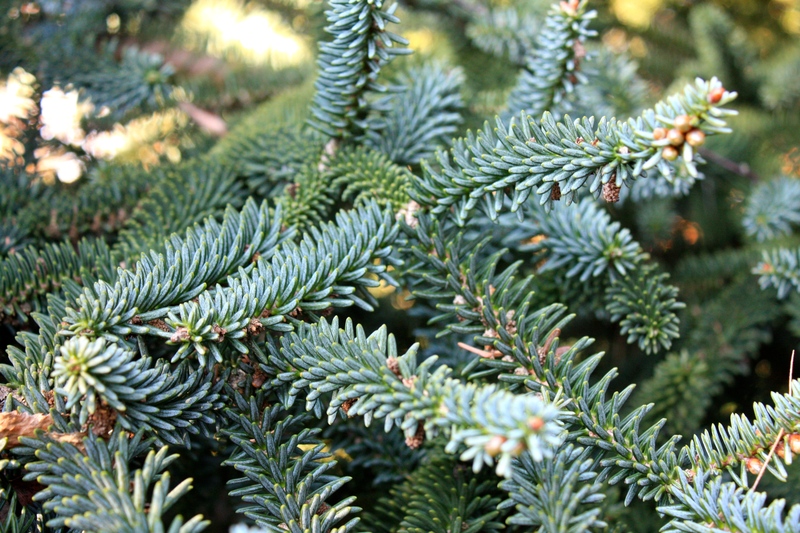 jacquemontii ‘Jermyns’, an equally refined cultivar that originates from the Hillier Arboretum in Hampshire. This vigorous tree sports long catkins, up to 10cm long, in early spring. The mahogany coloured branches that bear them eventually turn bright white with age. To preserve the bark’s brilliance, BlueBell Nursery suggest scrubbing gently with a hand brush and water once every year. This removes any unsightly dirt or algae and does no harm to the tree. 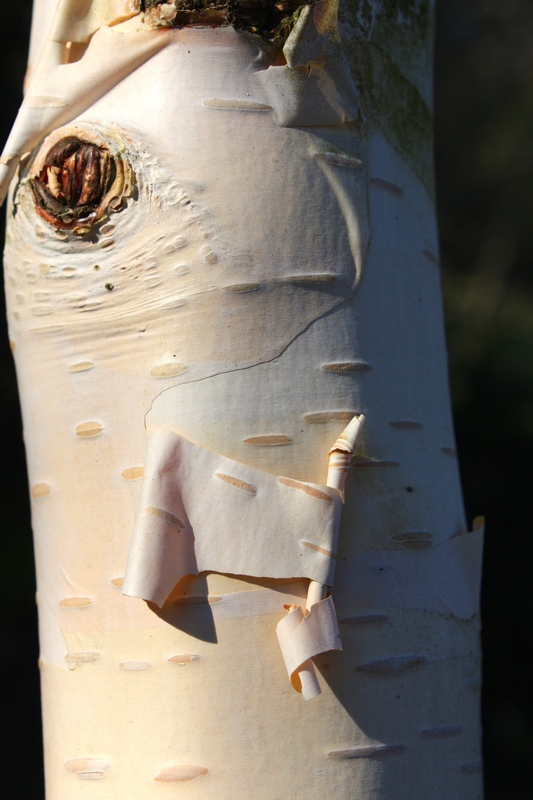 Hailing from Afghanistan, Northern Pakistan, Bhutan and Western China, Betula utilis ‘Doorenbos’ (below) is a slim, fast growing birch with especially beautiful peeling white bark. Although vigorous, it makes an excellent multi-stemmed specimen tree in smaller gardens and is particularly striking when planted in groups against a dark backdrop. The bark is silky smooth, inviting a stroke as ones passes by. 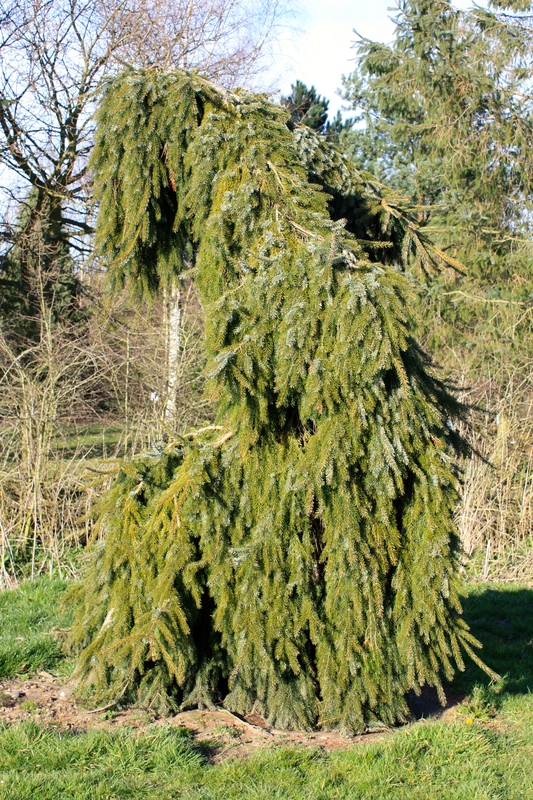 As well as birches we admired a host of evergreens, including the Spanish fir (Abies pinsapo ‘Glauca’), giant redwoods (Sequoiadendron giganteum) and the strangely stooped and contorted weeping Serbian spruce (Picea omorika ‘Pendula’, below). I had my first introduction to choice shrub Illicium simonsii and pretty white Camellia japonica ‘Lovelight’. Naturally I succumbed to retail temptation and we struggled home with a lovely clematis, C. ‘Guernsey Cream’ which I hope will soon grace our London brick walls with an expanse of large, buff flowers. BlueBell Arboretum and Nursery is somewhere connoisseurs and botanists will appreciate at any time of year. For a casual browse, spring through to autumn would be my recommended visiting period. Although the nursery doesn’t offer refreshments or toilet facilities, the local pub, The Smisby Arms, looks particularly inviting. Bluebell Nursery has some wonderful trees and shrubs, many of them unusual. I love all the Birches. It is good to hear that scrubbing them is recommended. I have always done it but felt a bit of a vandal. It’s nice to know the experts do it. I have to admit to peeling them too, I am sure the experts don’t recommend that. I can’t resist it though . It’s like popping Fuschia flowers when you were a child. 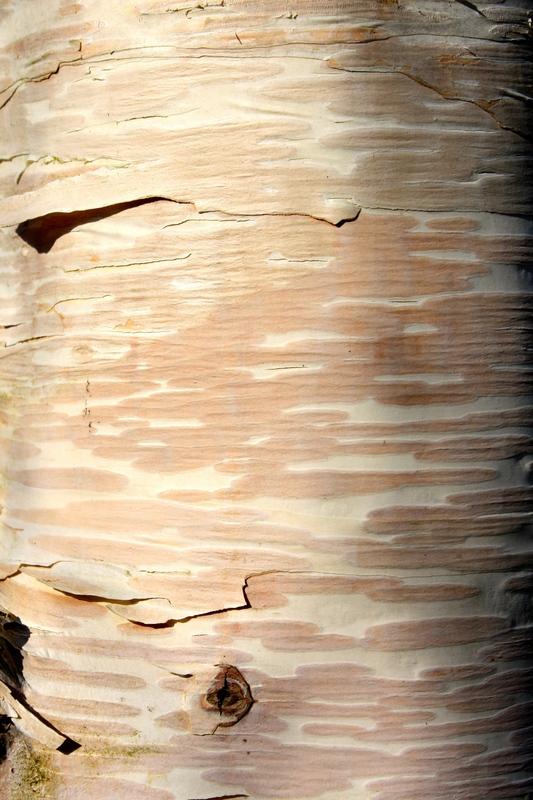 Few trees can compete with birches when it comes to the bark – love them all. I wonder if the Liquidambar manage to get at its best colouration in the fall in your climate? No, it can vary a lot depending on the weather. Often, when autumn is wet and mild, the colours don’t develop as they would in a colder climate. Thanks – it’s a beautiful tree anyway.